Last week I wrote up an article about cutting your home heating costs. The discussion that followed in the comments section was full of more great information, and it even led to me making a small change in my own house that should work out to surprisingly large savings. This rather simple trick was: Changing my master bathroom showerhead from a 2.5 gallon-per-minute model to a 1.5 GPM one. In recent decades, the US Environmental Protection Agency has been tightening up the rules on how efficient household appliances and fixtures must be in order to be sold in stores. Various regulation-haters have complained at every step, but regulations of this type actually bring people more freedom – freedom from their own stupidity! Nobody knows or cares how much energy they are using, they just live their lives and pay the utility bills. If you force the manufacturers to offer better products, the people buy them and unwittingly save themselves a shitload of money, all while helping the planet. It’s a win/win situation. Here are some examples: In the olden days, toilets required as much as 3.5 or even 5 gallons of water for each flush. Simple re-engineering of toilets has brought this down to 1.6 GPF and more recently 1.28. These new toilets still work just fine, and don’t cost noticeably more, but each one ends up saving the equivalent of a full backyard swimming pool of precious drinking water every two years. And more significantly, showerheads have also been re-engineered to use less water and heat energy. Before 1992, showerheads could dump out 4-8 gallons per minute. In the 1990s, the US standard became 2.5 GPM. This is when I started building things, and I have always felt good and virtuous about installing and using 2.5GPM showerheads. But someone recently informed me that there are 1.5GPM and even 1.25GPM models that are carefully designed to be just as nice as a standard 2.5’er. Ten bucks or less for massive savings. For example, here’s a 1.5 gallon showerhead on Amazon that has over 150 reviews averaging almost 5 stars = for under ten bucks. “Could this really be?”, I wondered. “I work hard sometimes, and I get coated with sweat, concrete, sawdust, and blood. And I’m a wealthy man who can afford a nice shower. As creature comforts go, it’s a pretty cheap one, so I will not compromise on a good hot shower with plenty of pressure and cleaning action”. Mr. Money Mustache: 3 showers per week on average, duration of 5 minutes, temperature 107 degrees F.
Mrs. Money Mustache: 4 showers per week, duration 10 minutes, temperature 107 degrees F.
Junior ‘Stash: still taking about 2 baths/week, hopefully will graduate to showers one of these years. Total shower duration per year: 55 minutes per week x 52 weeks = 2860 minutes per year. How much does a shower cost per minute? The 2.5 gallons of water I use per minute cost about 1.25 cents according to my utility bill (0.5 cents per gallon). These 2.5 gallons of water weigh 20.5 pounds. This water enters an average house at about 50 degrees Fahrenheit and must be heated by an additional 57 degrees. A hot shower with a standard showerhead costs about 3.25 cents per minute. With an electric water heater and 12c/kwh electricity, this cost would be about 5.3 cents per minute. So if you’ve ever wondered about the cost for a 10 minute shower, now you know: it is between 32 and 53 cents. Now how much can the Money Mustache family save each year by going from a 2.5GPM showerhead to a 1.5GPM one? By dropping from 2.5GPM to 1.5GPM. we save 40%, which is $37.18 per year. Wowee. Almost $40 per year from a $10 device is a much bigger return on investment than I’ll get anywhere else. And it’s over 5% of my annual spending on natural gas. So it’s a worthwhile savings. But is it going to hurt my tradition of enjoying Hearty Manly Showers where the water runs black from the extreme filth I am scrubbing off? 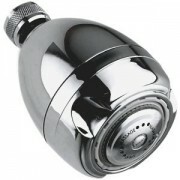 To find out, I looked up some of the well-reviewed 1.5GPM showerheads on Amazon.com like this one*. The people seemed to say that their showers were just fine, and many couldn’t even notice the difference when dropping from 2.5GPM. Good enough for me. I picked one up for $10 bucks, and screwed it on. It is great! I too can hardly notice the difference, my showers still feel great, and the Mrs. actually likes the new showerhead better than the fancy-looking one that came with the new valve system I installed when I built our new master shower last year. So it’s a hit. A savings of $40 per year goes straight to your bottom line – flowing into your ‘Stash and eventually becoming part of your retirement income through reduced living expenses. To generate this much income forever, inflation-adjusted using a 5% withdrawal rate, you would need to leave $800 permanently invested. So just by sharing this little secret with you, I have made you $800 richer, just as the readers of the earlier article made me that much richer by sharing the same trick. Happy Holidays! * I was planning to get the Amazon/Niagara one after reading the reviews, but I happened to be in Home Depot and saw a bin of Pfister ones at the same price. So I picked one up, figuring I could always return it if the performance didn’t match the better one I read about. But as noted, this one works great too and earns Lady approval, which is the key factor. Interesting. I have not even looked at what the flow rating is on my shower head. I’ll have to check that out and will definitely replace mine if it is higher than 1.5GPM (it probably is). I take 1 shower every day so I will flowing quite a bit into my ‘Stach. Thanks for the tip! Another bathroom fixture I recently came across was a drop-in dual flush converter. Ever used or installed one of these? Seems like it would be a good idea. Dual Flush toilets were in every European city that I traveled to in the spring. I think they are a great idea! If you already have a low flow toilet try paying attention to the handle when you flush. On mine if I only hold it down for a second or so it does a partial flush which is just enough to replace the water in the bowl. If I hold it down for 4 or 5 seconds it dumps the entire tank. Not as simple as picking which button to push but effectively the same performance and free. I don’t agree with the premise that federal regulations = more freedom, and I don’t believe in legislating common sense, but I do agree that spending $10 now to save $100 over the next year is a good investment. Thanks for the correction, and it revealed another error I had made – I had to change the whole title of the article to account for it! But it’s better to catch it at 7am than at the end of a day. I don’t believe in legislating common sense either – otherwise we’d have to drastically change almost every aspect of American life. It’s much nicer just to write a blog about it and let people choose their own path freely. However, when there are external effects involved such as our shared environment and national security, as there is with energy use, the logic is different. I wouldn’t say the logic is different. I’d say government should see that the true cost of everything be adequately reflected in prices. The next time you pull up to the pump, you should be paying a war tax for every gallon of gas you pump. After all, you don’t get $3.50 gas without killing a few middle easterners now and then. Same goes for water. Let’s calculate the true cost of water and put that in everyone’s bills. You don’t need to stack the deck. Make fair rules, and everyone will play the game smarter. I have to disagree – you would not find much in terms of shower heads if the government hadn’t legislated they should be lower in water usage. So you would have very little choice in low flow showerheads, and hence, very little freedom. 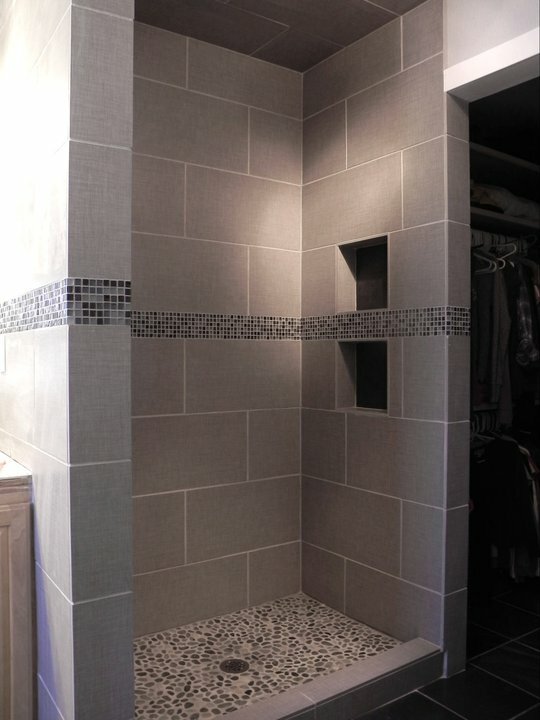 You can always use your carpentry skills to good use to make the shower flow more… and there’s front and side jets too. It’s harder to go the other way around. Bricor makes 1gpm and 0.55 gpm models at a cost of $75. If you switched to the 0.55 gpm, you would save $200/year. It might not be that pleasant, though, especially in winter. Your actual savings on the utility bill may be greater than you estimated. Here in Colorado Springs, they charge a wastewater fee for every gallon of water we allow to go down the drain (an estimated amount). However, if you reduce the amount of water used for showers, the amount of wastewater will go down proportionally. Thanks John – In this case, I included both my supply price and the metered wastewater cost in my 0.5 cents/gallon figure. But another factor is that we probably take fewer showers than average. A household where both people shower every day would be looking at more than double the savings I described in this article. Add in a flock of teenagers, and the savings go through the roof. I know about teenagers and showers. I have four of them who run the water until all the hot is depleted. None our bath, shower or washing machine water ever goes down the drain. A few years ago our neighbours were re-doing their irrigation in their garden. They were going to throw away those plastic pipes. We saw that the end attachments would fit at the end of the outlet pipe that poured all that soapy dirty water down the drain. Now we use the pipes to direct where we want to water our garden. By using this and our rain runoff drum that is attached to the end off the down pipe from our roof we have not had to pay to keep our garden and vegetable garden thriving throughout the year. Kristy, Does the soapy water harm the plants? No, soap is fine for plants. It can actually help against pests, too. We are charged wastewater at the same quantity as water. It doesn’t matter what actually goes down the drain. Interesting… do they actually measure your waste output? Or do they base it on the amount of water consumed/used? If they actually measure the output (which seems pretty technically difficult to retrofit and implement) a gray water system could be worth looking into. It is an estimate. It would be extremely difficult to meter waste water since you typically mix other waste in with that water and it would create another bottleneck for things to jam up in. And as Chris pointed out, this does create an incentive to send greywater to your own garden for double savings. I have considered such a project myself, but with water being so cheap it is a lower priority than solar heat projects. What they do where I live is assume that “Water In” equals “Water Out” during the winter. So you get charged a sewage fee year round based on how much water you used during the previous winter. Everything else is assumed to be recreational water usage (ie: watering lawn, pools, washing car, etc). From my understanding, there are often 2 meters. One measures water that goes into your house, and the other measures water that goes to the spigots outside. The rates for the 2 are different to add the wastewater fee to the indoor water. $10 is hard to beat, and a better return than you’ll make in the stock market probably. I put that bad boy on my Amazon wish list to order when I get above $25 (for free shipping). Bricor makes 1 gpm and 0.55 gpm models for $75. The scant reviews of the 0.55 gpm model are favorable, though obviously it wouldn’t be comparable to a 2.5 gpm head. The 0.55 gpm model is meant for RVs, etc. For you, it would pay for itself in a year. For me, it would pay for itself in a few months. How do you get away with only 3 showers a week? My hair gets greasy every day whether I sweat or not. I also shave in the shower every other day. I guess I could try just wiping my hair down for a few days. I did install a Danco 89171 valve so I could easily take navy-style showers with any shower head. I use the Bricor 1.0 gpm model, and it actually is more like 0.9gpm with our water pressure. It’s actually a great shower and even the lady of the house approves! Wait, what? 3 showers/week? I have an average of slightly more than 7 showers/week (baseline shower every morning, and I get an extra afternoon shower from working out more often than I skip a morning one) — and I never would have guessed anybody else did any different. Does your ‘stash absorb grease or something? Maybe a topic for another post, I’ll be watching! P.S. I don’t know if you’ve covered this before, but solar water-heating panels (different than solar electricity panels) do a great job of padding your ‘stashe by increasing the temperature at which water enters your water heater, so you don’t have to burn as much fuel to get the water up to temp. Haha! I think it’s a common myth that you need to shower every day. A daily shower is likely unnecessary and may actually be bad for your skin and hair (http://www.nytimes.com/2010/10/31/fashion/31Unwashed.html). It probably depends on a lot of factors such as how much you exercise and the area you live in. In a dry climate like Colorado, my skin feels much better if I skip a day and my hair feels and looks better too. I can go a max of 3 days without a shower, at which point a ponytail becomes necessary. I do wash my face every day and don’t wear make-up and don’t put any stuff in my hair, so that probably makes a difference as well. I can also spot clean, like if I need to freshen up my armpits one morning. Since I work out about 3 times a week, I usually shower after my workouts plus one other time after runs/hikes, etc. Our son used to take frequent baths, but his skin would dry out a lot and he had eczema that would flare up. He’s down to 2 baths a week now and it seems to be just right. I would love to not have to shower so often! I work with animals, which means that I have to clean up a bit more often to prevent transmitting anything they have to the family. i will, however, say I totally agree with you on the health benefits of NOT showering sometimes. Re: Yr son’s eczema. Try Cerave moisturizing cream, comes in 16 oz tub and doesn’t have perfume/scent and is non-greasy. I use it to moisturize problem area, foregoing medications/cortisteroids and it works to keep flare ups to minimum whereas cortisteriod did nothing. I found hundreds of favorable comments on Amazon and bought locally, all drug/dept stores carry it. Thanks Kitty, but with fewer baths and perhaps just getting older, it has completely cleared up. I tried a bunch of different creams when he was younger, but his skin was sensitive to almost every one. The only one that didn’t cause him any issues was a burt’s bees natural cream. I do think that cutting down on his baths made a big difference at the time, so we still continue that practice. I’ve been doing this for about two years and my long hair no longer gets split ends and is better than ever. Check out this post regarding our obsession with cleanliness. Oh, thanks for putting this in about the reduced frequencies of showers (and the responses too). I’m moving into a tiny, tiny home in a month, and the shower is the missing item. So…the gym has been my go to for showers, but I know there are going to be times I can’t get there daily. I was planning on going a couple of days in between, and glad to know there are others that do as well. Thanks for the Christmas present. I’m going shopping. You definitely are becoming one of my favorite blogs. Wonderful writing. I have been using a 1.5 gpm roadrunner showerhead made by Evolve for years and love it (http://evolveshowerheads.com). It has a built in adapter that shuts off the water once it reaches 95 degrees and you resume flow by pulling the little string on it. They also sell the little adapter separately so you can attach to any showerhead. Our apartment shower takes somewhere between 5 seconds and 5 minutes to get hot so this is great for us. We don’t pay for water or gas but I couldn’t stand the waste before we got this because it was so easy to start doing something else and forget about it. Sorry for sounding like a commercial but it really is pretty sweet. Slightly off topic… but you mention low flow toilets … and yes, the euro dual flush is the sensible way to go… But… if you’ve had a bad experience with low-flow toilets (and everyone has at some point) check out terrylove.com. He’s a plumber and has reviews on some models of low flow toilets. There are definitely good ones he has not reviewed, so if a local plumber you trust recommends something… it’s probably ok. But, if you’re going blind into Home Depot, it’s a good list to have. I’ve been happy with his recommendations in the past. Also speaking of low-flow toilets, I’ve used a couple different dual-flush converters on my toilets which have worked very well. They run about $20-$30 and are easy to install. I didn’t want to mention this ’cause it’s gross – but since you bring it up… We put in 2 low flow toilets almost 2 years ago. A cheaper costco one downstairs and a more expensive TOTO one upstairs. Our son kept on clogging the costco one and it seemed very tricky to plunge. (The old toilet never clogged in the 15 years we’d lived here.) I so wish we had paid extra for both. (I know people that have pulled out low flow toilets within a year of installing them.) It pays to do your research on these. There is a MaP score (maximum performance). Learn it. Thankfully the son has moved out! Sorry to rain (ha!) on your parade, but have you actually timed your showers? The savings you might make on the low pressure showerhead are probably being negated by longer shower times. At least, that was the consensus of several hotels I’ve worked for. That’s a good idea, I’ll try timing my showers with both new and old showerheads! It sure doesn’t FEEL like I am taking any longer, since only a small portion of the time is spent rinsing off soap. Most of the time is spent putting ON some soap and scrubbing off the day’s debris. And I’m definitely not taking a 40% longer shower, since that would be obvious even without timing. My wife takes 30 minutes to shower, and 60 minutes if she is doing her hair too, but she probably runs maybe 5-10 minutes of actual water time. It does help having a single valve to set rather than tinkering with cold/hot knobs, but it makes me wonder why I don’t put a garden hose style watering head with trigger. Please let us know if you have any installation issues. Thanks! I’ve put in 2 Jacuzzi model low-flow toilets (bought at Lowes for about $125) and I don’t think they’ve ever clogged. Going to buy another one for our bathroom when we renovate it. We bought a cheap dual flush for the kids bathroom from Home Depot and it has been great as well. The #1 flush works fine most of the time even for little kids’ #2. We used to have issues with toilets plugging up (two young kids who like to use lots of TP) until we switched to septic safe TP. It breaks up into smaller pieces rapidly which makes all the difference. Low flow is a good idea, if only for the water savings, but I wonder if we’re really saving as much as we think we are on water heating costs. Water Flow * Temperature Difference. Is it possible that, as humans beings who want to feel a certain level of “warmth”, we are turning the tap a bit more towards the hot direction to make up for the fact that there’s less volume of water spraying at us? That’s another great theory. But I believe it is not the case, because I had already configured our water heater and shower valve such that when you set the shower valve to its maximum heat, you get a perfect shower (because running your water tank at the lowest convenient temp saves energy). Showers with both the old and new showerhead both feel comfortable. Frugal Toque of course doesn’t care about these things in practice because he has a well that provides unlimited free water and a geothermal heat system that very cheaply heats it using energy from the soil. We already have a water pressure problem in our house but the real problem is that in the master bathroom upstairs, when you turn on the water for the shower (shower is separate from bathtub, which is a roman tub with no shower fixture at all), it takes a good five minutes for it to get hot at all. I can’t figure out why for the life of me. The showerhead is not a water saving one, it does have a removeable handheld showerhead, not sure if that has anything to do with it. Recently I ordered a 2.0 gallon per minute new handheld showerhead and it resolved the water pressure problem in that shower, but when I turned on the water to take the first shower with it, I ran it for TEN minutes, and there was no increase in hot water beyond barely lukewarm. I then removed the showerhead altogether, turned on the hot water, and within seconds, it was hot. This is very frustrating for me as I WOULD like to shower once in a while rather than flopping around in my roman tub, dumping cups of water over my head to rinse my hair. Is the ‘low flow’ of the showerhead resisting the flow of the hot water so much that it takes that long for it to get out? Is the design of the handheld showerhead working against me as the water has more chance to cool off (moving through a thin plastic hose in between the wall and the showerhead) before coming out? Am I wasting more water (and time) with a low flow showerhead waiting for the water to get hot? Please help!! Your house probably has a REALLY long copper pipe run between the heater and that shower. The ultimate solution is to run a short, direct PEX line from the heater to that shower, but that would only be feasible if you were doing some remodeling anyway. Another option is an electric on-demand heater in that bathroom cabinet, plumbed directly to the shower. Easy solution is to use a different shower. Actually, we do use low flow shower heads anyway because it’s silly to throw the stuff down the drain even if it goes back into the water table. The flow is so slow that, even on the relative-to-city-folk low pressure of our pressure tank, you can flush toilets while someone is taking a shower and the person in the shower doesn’t notice. Does the Mustache family use a dish washing machine? Those have electric heaters in them that are relatively inefficient compared to natural gas, which means that your shower-water temperature hot water source has to be electrically heated in your dish washer. Maybe you do all of your dishes manually. My understanding is that electric resistance heating is 100% efficient at converting electricity into heat. (at the point of use, electric generation to point of use is a whole other story) Natural gas heaters area always less then 100% efficient. Electric heat however tends to be more expensive the natural gas generated heat but this depends on the costs in your area. My electric is real cheap and gas can be quite expensive so there isn’t an obvious winner without doing the math. My hot water tank is partially geothermally heated (at somewhere between 3.2:1 and 4.0:1 over electrical heat) so i know that my hot water tank will win the race against my dishwasher any day of the week. Your mileage, obviously, may vary. That’s another interesting consideration.We do use a dishwasher quite a bit in the MMM household (it became profitable on a time/cost basis once we had a kid around). Water heaters are pretty impressive, but you may be right. The advice we were given was to run the dishwasher immediately after washing any large pots and pans that wouldn’t fit in the dishwasher. That way we’d at least get the benefit of already having hot water in the pipes. I think the most interesting thing we refused were these recycling pipes they wanted to put in. Basically, the hot water pipe continuously feeds back into the hot water tank in a very slow cycle so that you have instant hot water whenever you turn on the tap. Insulated, sure, but it sounded pretty wasteful for the 23+ hours a day I don’t need hot water. Good choice – the recirculating hot water system is convenient for impatient hedonists, and cost-effective if you are running it during the heating season if your source of hot water is at least as efficient as your furnace (since the actual energy for a small pump to accomplish the circulation would be tiny). But if it also runs during the summer cooling season, it would be a disaster! It’s effectively a full house hydronic heating system. You don’t want that for at least 5 months of the year in Ottawa, and at least 11 months of the year in other places. They do have these hot-water circulation systems like this that are operated by a button, so you just push the button before the hot water is needed, and no water is wasted down the drain waiting for the water to get hot. Multiple wireless remotes can be placed around the house near each how water using device. Since the pump only runs on demand, no energy is wasted heating pipes 24/hr a day. They use the cold water line to return water to the water heater. There goes my idea for a new product to hit the market. I was just thinking about that, what if I had a valve near my shower head which I could turn first to tell it to basically purge the water by dumping it back into the water heater, then with some sort of indicator I could turn the valve back to providing me with hot water. While a recirculating system may or may not be advantageous, there does exist a drain heat recuperation unit that might make sense in some instances. Behold: The system consists of a coil like copper attire that rests either in or around your water drain ( a copper jacket for your drain if you will). When one(or two if you are feeling frisky) takes a shower, most of the water going down the drain is still full of yummy thermal energy. The purpose of the system is to capture some of that energy and put it towards reheating the new, cold water coming in the water heater. The more often you use hot water, the more it makes sense to use such a device. Up here, such a device can be had for around 800$ minus incentives from the utilities companies. 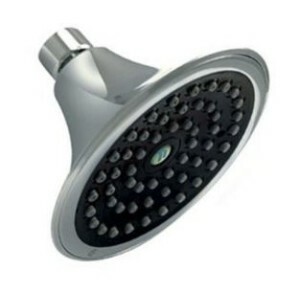 Of course, the payback is much longer than a shower head, but this device is good for many many years. One other nice tip is to get a shower head with a quick on/off button. This makes it easier to lather up without running water while you try to stand out of the spray. I try to keep the water mostly off while scrubbing/lathering and just turn it on to rinse. I would think it helps reduce the water used but I haven’t actually measured to be sure. This is the shower head I bought last year. Sadly amazon doesn’t list the flow rate when it is fully “on”. You can slide the button gradually from full on to just a tiny trickle. I had one of those installed in the past – an on/off valve at the showerhead in the hopes of saving water while lathering up etc… The only problem was that the hot water rises in the pipe running up to the showerhead while it’s off – so when you turn it back on after a minute or two you get hit with a shot of hot water, then a shot of cold, before the normal regulated water flows back in. Eventually it broke and I was happy to just have it removed. That would definitely save you some water if you are tough enough to lather up with the stream off. By the way, Peter Lyons – are you really that gold-colored dude with a beard playing a saxophone while wearing sunglasses? That would be pretty cool. I think I need a new avatar. This Ulysses S. Grant one makes me look fat. I’m a bit of a freak on this front. I’ve spent some time on tiny tropical islands (Thailand and Philippines) where fresh water is at an absolute premium – inconceivable to stand there with the water running while you lather and scrub. Lots of the $3/night bungalows where I’ve stayed just had a small faucet and a pail that you would fill up and throw over yourself, like the locals did. I kind of got used to this, so now it just seems natural to use about 30 seconds to get wet and 1 minute to rinse off. I’ve challenged my 10 year-old son to keep to under 2 minutes of running water per shower and he likes it (basically, all I had to do was say ‘I bet you can’t do it!’). It does get a bit chilly in the winter, but I figure hot running water is a really expensive way to keep warm, and if the Finns can jump out of a sauna and into a snowbank maybe there’s something to be said for withstanding a few minutes of cold once a day. However, I don’t buy that conservation efforts should be calculated as financial savings. This is because the utility rates are rising faster than we can conserve. MMM, do you think that the raise in utility rates should be factored into your calculations? I ordered two shower heads from your link before I even finished to the post. I hope you have some sort of deal with Amazon to get some money back. We have a tank less water heater in our home (Culver City – South California). And while this technology has some great benefit on the long run, there is a real draw back: every time you take a shower, it takes one to two minutes to deliver the hot water (at the exact temp. you specified) to arrive in the shower head. This means there is some sort of incompressible “waste” cost every time your take a shower. I am planning to add a system with a 3 ways valve in the shower so the cold water will go first to our external cistern for a minute then switch to “shower” to get the warm water. I got sent a free flow restrictor through the mail, and only just got round to actually fitting it after reading this post. I’ve run through your calculations and converted everything to UK units (I’m getting quite good at converting $ to £ in my head after reading your blog for a few weeks, but BTU to kWhr was a bit beyond me). My water isn’t metered, and the gadget I got will only restrict flow to 7.7 litres (2 US gallons) per minute, but even so, I reckon I’ll be saving about £17.70 ($27.75) per year, which is about 5% of my gas bill. Not bad for something I got for free! I’m kicking myself for not having fitted it sooner. Thanks MMM! Good job! .. what was the flow rate of your old showerhead? Did you measure it with a bucket, or was it printed on the head? The gadget I was sent came with a plastic bag with a line on – you put the showerhead in the bag, turn it quickly to full power and time 5 seconds, then turn it off. Then hold up the bag and see if the water level is above the line – if it is, the shower is using more than 7.7 litres/minute and they recommend fitting the device. Eyeballing it, mine looked like it was putting out about a little over 10 litres/minute (2.6 US gallons/minute). After fitting the device and trying it again, the water level was right on the line, so it seems to work. Mine was from a company called Eaga, and is called a Shower Smart. They don’t seem to be doing them any more (or at least not giving them out for free), but I was recently sent ANOTHER one from a different company, called a Shower Saint, and looking at their website (http://www.showersaint.com/) they still appear to be giving them away. Only seems to be available in the UK, but if there are any fellow UK Mustachians reading this comments thread, perhaps they’ll be interested! Wow, I live in a house with two other roommates and we both take reasonably long showers with a standard 2.5 gpm low flow faucet every day. Three 10 minute showers per day equals 30 minutes a day, 900 shower minutes a month equals 2250 gallons of hot water from an electric heater. Not sure about the temperature, though the heater is set at the “recommended” settings…it might be more than what you calculate, but using your figures at 15 cents a kWH that works out to $59.63 A MONTH–or more than half of our most recent electric bill!! I had no idea showers cost that much! That alone is enough for me to just use straight cold water or head to the gym for my hot showers! I don’t think I can convince my room mates to be that drastic, but through the shower head switch alone I think I can easily recoup the bill in a few months. You’re spot on – in fact, since the showerhead only costs ten dollars, you’ll recoup its cost more than twice over EVERY MONTH.. In fact, in your house this showerhead alone is going to be paying for someone’s entire beer bill with its savings! From the comments, I learned that most households take a shitload more showers than ours – I should have named the article something like “a $2000 gift” instead of an $800 one. I ordered the low-flow shower head your linked to the very day you made this post, and we have been using it since it arrived. I measured the output by bucket and the new shower head is less than half the flow of the old one. I’ll be honest, the first two weeks of showers I could constantly “feel” the lack of water coming out. It was just “different”, and who likes change? Thanks for the tip, if I hadn’t followed it I would be due a solid punch in the face. Another thing you may want to consider is a Drain Wastewater Heat Recovery pipe, such as the Powerpipe. Basically, as you take your shower all that heat is going down the drain, when it could be used to heat the cold water going to your tank! So companies have created a pipe that basically acts as a heat exchanger between your incoming water and your drain water to capture the lost heat. They are solid copper so they will never go bad, and the more people in your house, the more you save. If you hate the energy efficient showerheads, you definitely want to give this a try since it will save you more. (There are other brands, but last I looked this was the best). Hopefully I’m not repeating anything here as I only scanned through the comments. For houses that have the old, big-turd-flushing toilets, why not just put a brick or two in the tank to take up space/decrease water rather than exchange the toilet?? The city where I live is actually giving rebates to people who exchange their toilets. I emailed them to give out bricks instead, as that is my tax dollars going into other peoples’ toilets!! AND, the recycling station has hundreds of toilets dumped there!!! How good is that for the earth?!?! A few years back I was in Germany and the house I was staying at had a wonderful shower!! Along the outside pipe that went to the shower head, there was an on/off switch that shut the water off mostly but not totally, so that it trickled water and allowed the water to stay the same temperature when turned back on, avoiding scalding the person (as Valerie, above, mentioned). The problem with the brick is now you have a toilet that doesn’t flush as well, and still uses more water (not sure how much space the brick takes, but it’s probably not 7L). The new toilets are designed to flush as well with less water. If you have no money or no technical skill, then the brick is the best option, but a new toilet will work better. A gallon jug full of water doesn’t crumble into the plumbing like a brick. Also, your MMM flow is janky when you call your son Junior ‘Stash. Mr. Money Mustache, Mrs. Money Mustache, and Mini Money Mustache flows WAY better! I’ve thought the same thing so many times!! I went ahead and installed the Niagra showerhead last night, definitely lives up to the hype! (went from 2.5GPM to 1.5 GPM) Anyways, I installed it without pipe tape and noticed that the previous one I removed also didn’t have pipe tape. Do you recommend installing with or without pipe tape… getting conflicting messages from the internets, thanks! It depends on the fixture. Some want you to use tape, some don’t . Generally speaking, if it has a gasket or o-ring in the fitting, don’t use tape. If it doesn’t have any kind of sealing device like that, use tape. I LOVE LOVE this blog! I just purchased this showerhead to replace mine. I have no idea the rating on my current showerheard, but this will no doubt be an improvement! I will be looking into a low flow toilet or two, & solar heating…love it! Thanks for the info & keep it flowing!! Thanks for this tip! I just ordered my kit! Now this is not as low as you have mentioned in your text (maybe even better ones available now in 2014? ), 7l/min is something like 1.85USgal/min, and this cost me about 25€. But this has a constant water pressure no matter what the pressure in the pipers is (I have no idea of the water pressure on the house), this is definitely better than the one I have had and the fact that I can start using this right now instead of waiting one from internet stores for a week or more, I thought this was a good deal. Neil already mentioned, but I want to reiterate because my local (Ohio, Columbia Gas Co.) has heavily discounted and free energy saving products. I got the Niagara mentioned in the article for $0.95, including shipping. Thank you MMM! In a way I found your gift a few days late since I actually just installed a 1.25 gpm Niagara in the house I rent earlier this week. On the other hand, knowing you’ve also calculated the cost per minute of showering brings me almost as much joy as saving 50%. The math is even more compelling here in the Alaskan bush where water is 6 cents per gallon and is heated with 67 cent/kWh electricity. I calculated the old shower at about 33 cents per minute and expect the new one to pay for itself in less than a month. If anyone has tried or know how many gallons per minute the Super Power Showerhead (http://best-shower-head.com) uses, please post your thoughts. Thank you. Working my way from your first article to the most recent. I had to stop and say I am glad you put this info out there, *applause*! Did you know you can thread on adapters for your faucets too? Three showers a week, hmm. I could never get away with that. I train every day before work, so must shower between PT and work. My wife then does not let me in our clean bed until I have showered at the end of my day, so there’s another which is usually 2 a day at a minimum. I’d say 14-16 a week. Now, I know this is a lot, which is why I have adapted my life to the “combat shower” we use in the military. Hop in, get wet, water off, soap up, rinse off, done. So I’d like to think that using that method gets me some level of credit back. Great article! I’m slowly catching up, one article at a time, all the way from the beginning. Why not just do what I call ‘Military’ showers? Turn on water to get wet, then turn it off, and then turn it on to rinse off soap. Seems more consistent with the Mustachian spirit to me than 5-10 minute showers. Also I’ve started taking cold showers after reading research on the health benefits. Saves money on water heating costs too.